Welcome to the perfect combination of function, style and protection. The Griffin Survivor Adventure Wallet for iPhone 7 Plus safeguards your device from drops of up to 8 feet. Tested to military specifications, the Griffin Survivor Adventure Wallet for iPhone 7 Plus provides robust protection for your new device. Built with Impact Dispersion System, damage via drops or sudden force is kept at bay. Slim card slots on the inside of the case are perfect for holding your credit or store cards, the magnetic tab keeps everything securely in place, and an opening for your iPhone 7's front speaker means you can close the wallet while you're on a call. 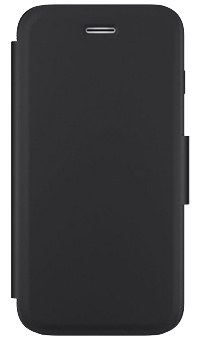 For style, snap the case off and snap on the transparent back-plate. For an ultra-light feel, go back-plate free while knowing the wallet's impact-resistant plastic shell is still offering complete protection for your iPhone 7 Plus.